While Charleston’s cooks are masters of the fried food genre, able to transform chickens and okra and green tomatoes and pickles into Lowcountry masterpieces using a bit of cornmeal and a tub of oil, you’ll be happy to know that options do exist for the more gastronomically refined. You want foams and emulsions and fancy seasonal ingredients pulled together artfully and creatively in luxurious historic surroundings? Well, I’ve got just the place for you. My friend Ang and her new husband Young accompanied Phil and me to one of the South’s shiniest food gems. Tucked away in a teensy alley off of happenin’ East Bay Street, McCrady’s was our splurge for the weekend, and worth every cent. The building has been respectfully restored to retain its original 18th century charm while incorporating modern details, such as the impressive walnut bar. (The building is listed on the National Register of Historic Places and Landmarks.) Just like the building in which it is housed, McCrady’s menu pays homage to traditional, local Carolina ingredients while it effortlessly incorporates modern techniques (foam) and trendy ingredients (black garlic). The talented Sean Brock is master at blending the old and new. Nothing felt forced on any of our plates. It was all very honest and comfortable and gracious and timeless. It was everything I like about Charleston, really. Our table was immediately greeted with multi-grain and sourdough breads and impossibly green olive oil. 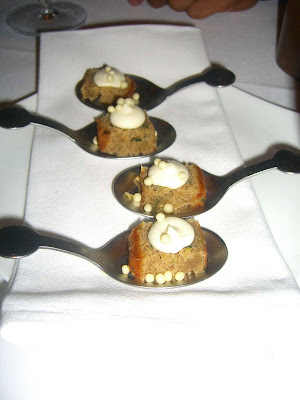 Throughout the meal the service was absolutely impeccable, never intrusive and always anticipating our needs. Even the water boy was knowledgeable about the menu and ingredients used. I asked him how often the menu changed and he excitedly engaged me in a conversation about nasturtiums and ramps! We were there in mid-June, at the tail end of the spring menu offerings. Many ingredients come directly from the restaurant’s very own farm outside of Charleston. Young and I both started our meal with a roasted scallop and roasted pork belly with charred Carolina peaches and creamed kimchee. 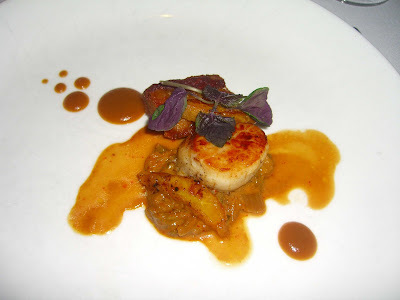 Scallop AND pork belly, on one plate?! Mmmm. 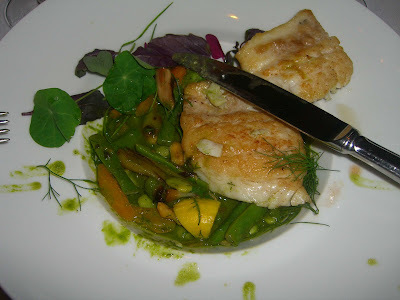 My main was Carolina triggerfish resting on a pistou of spring vegetables and herbs, with Marcona almonds. 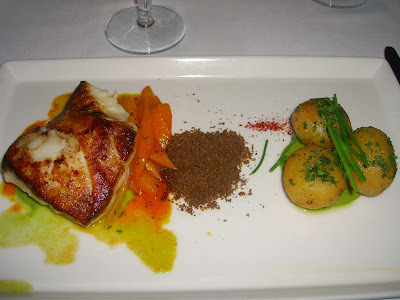 I’d never had triggerfish and enjoyed its flaky, slightly oily texture. It was firm, like grouper, and the flavor reminded me of snapper. 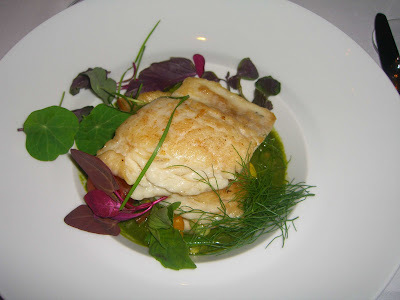 The delicacy of the fish was complimented by its bed of elegant, clean spring vegetables. Snap peas, young favas, and accents of nasturtiums, ramps and fennel fronds. I pushed the fish aside so you could get a glimpse of the veggies and herby broth. Young’s Harris Ranch beef striploin with carrots, smoked hollandaise, and a potato crusted potato was playful and engaging, on top of being uber-tasty. 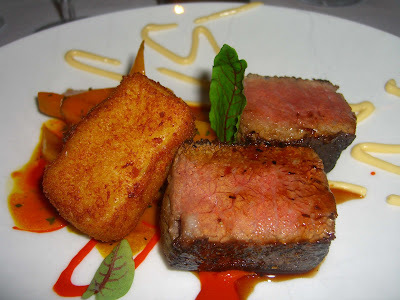 The blocky potato brick was the same size and shape as the beef – very clever and fun. To start, Ang ordered a salad of shaved vegetables, including raw fennel, and local lettuces, goat cheese, and a lemon vinaigrette. I didn’t get a shot of it but her main of local grouper, Celeste Albers' potatoes (basically parsley potatoes garnished with spring onions), black garlic, mushrooms, and leek fondue was the best grouper Ang had ever tried. Grouper is tricky to get just right, but hers was very moist. She substituted carrots for the mushrooms (she’s picky!). Phil’s meal was the best deal of the night. A three course prix fixe menu going for $35 Sun through Thurs. What a deal! 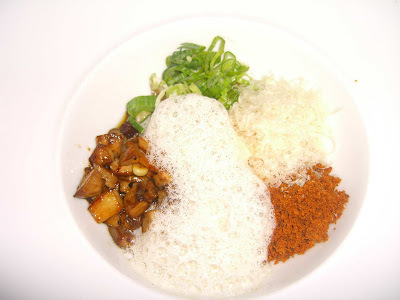 He started with a caramelized onion risotto with chanterelles and a brown butter emulsion. Followed by a Mediterranean inspired preparation of mahi mahi with, sauteed eggplant and black olives. Both the risotto and the mahi mahi were, of course, perfectly executed. The impressive wine list has won many Wine Spectator awards. I loved the diverse by-the-glass options and chose a 2007 Villa Wolf Gewurztraminer. Phil had a 2008 Budini Malbec from Mendoza. The meal ended with Phil’s chocolate and hazelnut tart with salted caramel ice cream and Ang’s tasting of ten sorbets. 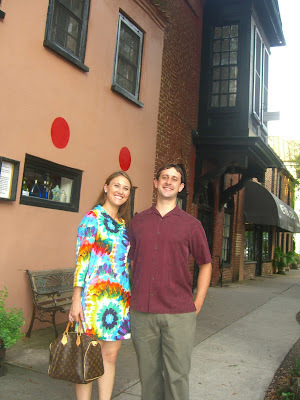 They were even more colorful than her kaleidoscopic frock! Coconut, blackberry, mango, lychee, pink guava, passion blueberry, mandarin orange, cherry vanilla, raspberry blood orange, strawberry apricot. It was impossible to choose a favorite! The kitchen surprised us with a complimentary fun dessert. It was a moist, cakey bread, maybe banana bread, with exploding frozen white mini chocolate beads that reminded me of the Dippin’ Dots ice cream of the future you get in kiosks at the mall. Again, a perfect combination of a homey dish perfectly accessorized by a modern technique (cryogenic encapsulation?!). Do yourself a favor and eat at McCrady’s the next time you’re in Charleston. 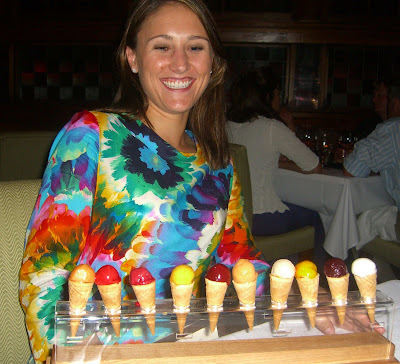 McCrady's is great and it deserves to be more popular - Chef Brock is doing wonderful stuff. If you're still traveling the South, I'd recommend Bacchanalia in Atlanta - refined southern food with some international influence - it was a surprisingly good meal. I love your pictures. I work for a company that is trying to promote Triggerfish, and I fell in love with the above picture. Could I have your permission to reproduce this photograph in my newsletter (giving you full credit for it)? Contact me at Dan@HeritageFoodsUSA.com if I can. Thank you!